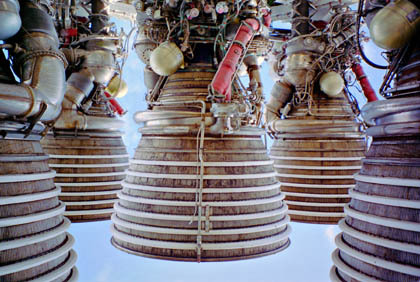 Eric entered in the U.S. National Park Service's 2005 'Imaging Our National Heritage' contest a superb photo of the Huntsville Saturn V second stage J-2 engine cluster. He was awarded third prize in the Southeast Region. Congratulations, Eric! I'm 34, in Knoxville Tennessee, and I do GIS and mapping work. Thanks to some 9/11-generated 'free time' in the form of unemployment, I built up my skills as a photographer and Photoshop user. And years ago I decided that Apollo would provide a research hobby that spanned many fields and would never run out of fun things to learn more about. It finally occurred to me that 3D is of interest to everyone in GIS and photography, and that the red-blue technique works great in both fields when done properly. I realized I had only done it properly with aerial imagery in GIS without thinking about what made that work so well, and when I did think about it, I learned what to do in my own Photoshop work. Most importantly, when things are done right and the image is in proper register, gray will still look gray and colors will appear as natural as they can...so a good 3D anaglyph shouldn't frighten anyone away!